What do tourists look for in their adventure holiday? Do they prefer nature walks, exploring monuments or indulge in a bumpy jeep safari ride? Then the terrains of the Madhya Pradesh can serve as a wondrous gateway for the adventure lovers to pump up their adrenaline rush. Perhaps Madhya Pradesh is one of those places in India where you can spot a tiger, a half arm distance away. Offbeat activities like river rafting, zip-lining, jumping, sliding, there is something for everyone here. Many people visit Madhya Pradesh solely for heritage and culture the city possesses. Madhya Pradesh has always been a state of rebels and risk-takers. For those, who like if their trip thrills then they should pack their bags and get set ready for an expedition to Madhya Pradesh. The diverse landscapes offer millions offers adrenalin junkies eager to engage in land and water sports. From the epic to the local, or even the lakes, the adventure tourism attractions in Madhya Pradesh will encourage one to dream, plan and set off on their own adventure. Mentioned below are some adventure ideas that tourists can enjoy a trip to Madhya Pradesh. Trekking: Trekking in Madhya Pradesh is all about exploring new archaeological sites, jumping on the craggy pathways, making a way between the hills and, of course, to gain spirituality quotient. The heart of India, Madhya Pradesh is bestowed with a myriad of landscapes and historical architectures that lures tourists from across the world to visit here. Each and every trek of the state has something exciting to offer. 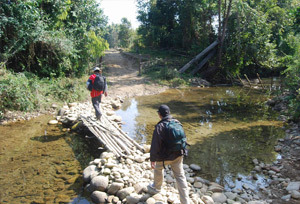 Best treks in Madhya Pradesh are Kanha Trek, Pachmarhi Trek and Amarkantak Trek. The Kanha trek will take tourist one step closer towards the jungle and a chance to spot the tiger are high. Pachmarhi trek is a must visit expedition as it unravels the marvels of nature. Whether the tourist is avid trekkers or a first-time visitor, trails in Madhya Pradesh offers amazing trekking experience. If a photography enthusiast, then these trails will give ample number of opportunities to click the best shots. Go on a trekking trip to Madhya Pradesh, embrace the beauty of the gorgeous Madhya Pradesh at its best and experience the deeply rooted traditions the state holds on. Trekking in Madhya Pradesh is a pleasure for every tourist that can't be easily described in words. River Rafting: Itching for some action? Go for river rafting in Madhya Pradesh. 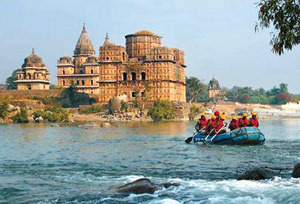 Rafting through the wild waters of Madhya Pradesh is an experience of the lifetime. In Madhya Pradesh, the river rafting can be best experienced on the gushing rapids of Betwa River. The flow of the river will take tourists to the weirdest, wildest and wackiest area of the Madhya Pradesh, some of the best places in the state to spot rich flora and fauna. Rafters encounter the best of Betwa River in all its glory. The 3 hours river rafting expedition will take one to the Orchha Wildlife Sanctuary, further downstream to the KanchanGhat. Monsoon is the best time to raft in Madhya Pradesh. Rapids here range from Grade 1 to 2. When not riding the rapids, tourists will see gigantic architectures and statues that are positioned on the edges of the Betwa River. Now, don't wait further and go with the flow. It's simple and relaxing and the waves are good. Mountain Climbing: Rock climbing is one of those expeditions that is gaining momentum in Madhya Pradesh. The sedimentary nature of Lanjee Giri in Panchmarhi serves as the perfect place for the climbers to undertake the best of the expedition. Panchmarhi is breathtaking and climbing in such topography is something that every tourist shouldn't miss out. Here, the rock formation is unique and thus who are new to the expedition can also experience the whole lot of new world. Make way to Madhya Pradesh to experience a trip that is nice, lively and memorable. Parasailing: Want to fly free in the sky? Well, the best one can do is strap into safety gear, adorn a hamlet and run fast towards the jeep to gain the momentum. Parasailing as fun as its sound, it's safe as well. It makes the rider feeling of a bird, its free-falling. 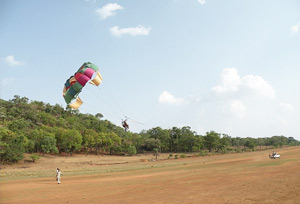 Parasailing in Madhya Pradesh fills every heart with thrill, vigour and excitement. It is perhaps the most enduring activity that can be best experienced in Madhya Pradesh, Just imagine, flying like a bird over the historical monuments, waterfalls and lush green scenery around. The sport will let one explore a different side of the Madhya Pradesh. Best Time to Do Mountain Climbing: October to December and January to April are the best time to try Parasailing. Mountaineering: In Madhya Pradesh, it's easy for the travellers to get mesmerised by its beauty. Here, they can find patchy roads, hills, Loafty Mountains, towering peaks, which ultimately makes it the favourite destination for the mountaineers and climbers. Mountaineering in the Maikal region of the Madhya Pradesh is fun in its way as there are no proper roads, no vegetation and dense jungle till the end. Even the immature climbers can indulge in the mountaineering here. Summer and winter is an ideal time to go for mountaineering in Madhya Pradesh.